Set the Kinetic Law Constants for Each Kinetic Law. Get the Active Configuration Set for the Model. 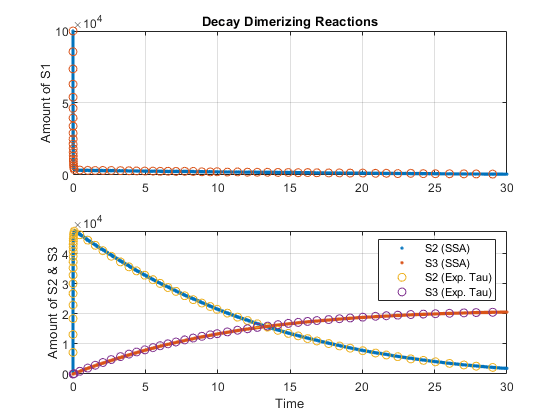 This example shows how to build and simulate a model using the SSA stochastic solver and the Explicit Tau-Leaping solver. 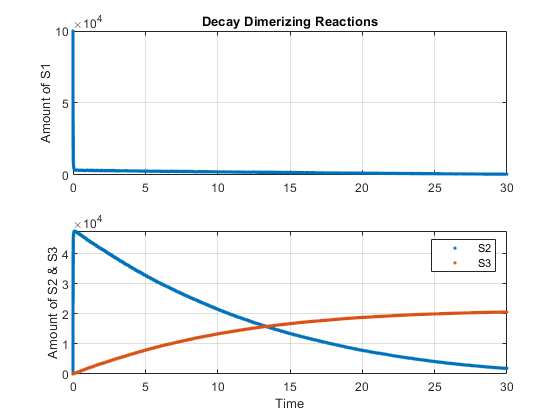 This example uses parameters and conditions as described in Daniel T. Gillespie, 2001, "Approximate accelerated stochastic simulation of chemically reacting systems," Journal of Chemical Physics, vol. 115, no. 4, pp. 1716-1733.
tfinal = 30, logging every 10th datapoint. Without closing the figure window, plot the results from using the Explicit Tau-Leaping Solver. tfinal = 30, logging every 10th datapoint. Acceptable error tolerance for solver, 0.03.